I received many request in airliner series and questions about how to customized livery of an Airline plane from Paper Replika. I decided to share the blank/white page template for you to recolor with your own style or your favorite airlines livery. This blank template comes in a package which consist of bitmap files (JPEG), vector images (EPS) and pepakura file (PDO). The PDO file is not developed on purpose, it's function is to be a 3D guide for recoloring which I will share with you how to do it in the next tutorial. The first one is this Airbus A320, the others will catch up later. This aircraft paper model template was submitted by Miguel Quilab. This is his second work which shared on Paper Replika, this time he recolor A320 with Cebu Pacific, another jetliner from Philippine. He said he made this template soon after he submitted the PAL template, but only now he has time to assembly the model. As seen on the photos below the engine on this A320 is different from master template so he use engine part from A330 TAM. Like his previous photos on PAL modelm Cebu model also equipped with landing gears and custom stand base, only this time he shares the landing gears and his custom stand base template with us. This landing gears kit is compatible for all A320 series from Paper Replika. There is no instructions on how to attach the landing gears kit on to the A320 model, you must figure it out yourself by looking at the photos below. Now I am still working on a commissioned project, so I don't have any update about new paper model even not have time to post progress pic on Paper Replika Facebook page and Tweeter as usual. 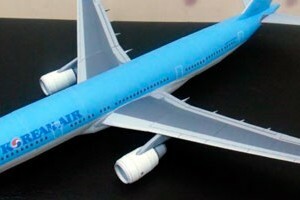 Luckily I had a new model from Zion (Kim Hyeon Gon), that is a recolored of Airbus A330 with Korean Air livery. I notice he use the KLM A330 template because the engine is the same. 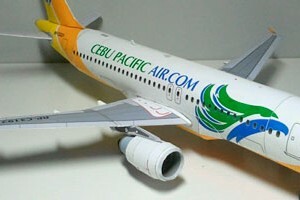 He also send his paper model built photos which the result are very neat and beautiful aircraft model. I also notice he use Adobe Photoshop to edit the model, I had to convert into more web-friendly PDF, resulted with 3.8 Mb from 20 Mb file size. 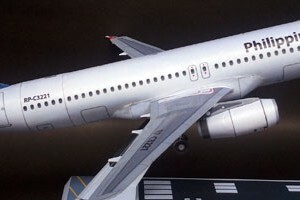 This is a model of a new and the first commercial aircraft produced by Sukhoi that went down on 9 May 2012 on Mount Salak. 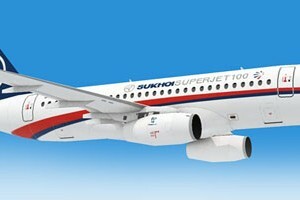 This RA-97004 Sukhoi Superjet 100 was in a second flight for a flight demonstration before the crash. There was someone I know on that plane, He was DN. Yusuf (Mas Didiek), he was an Angkasa Magazine photographer (Aviation Magazine). I first met him when I was a high school student back in 1994, I still remember Mas Didiek and Mas Suryolelono went to meet me for interview at my school (SMA Pangudi Luhur). Then we often met again in other Angkasa events or when I stopped by at his office, the last was in 2010. We are not close, but I knew he was a very warm and very kind person, he even advised me to go with my paper model hobby on my own with or without anyone supports, and that is what I do now. This model is a tribute to him, he died when working on covering this plane for the magazine, such a beautiful plane, such a sad tragedy.